Remember this summer's Garden Party dress? I've sewn it up again, this time in a lightweight wool suiting with velvet band details. Inspired by Oona's glamerous snowy photos, I headed back to the garden...this time accessorizing with my trusty snowshoes, to keep from sinking to my knees! You might recognise the navy ribbon belt, which I borrowed from the original dress. I changed the bodice from the last version, ommitting the front slit and lengthening the sleeves to below the elbow. ...and that hidden hem band detail, which makes its way onto most of my pieces. 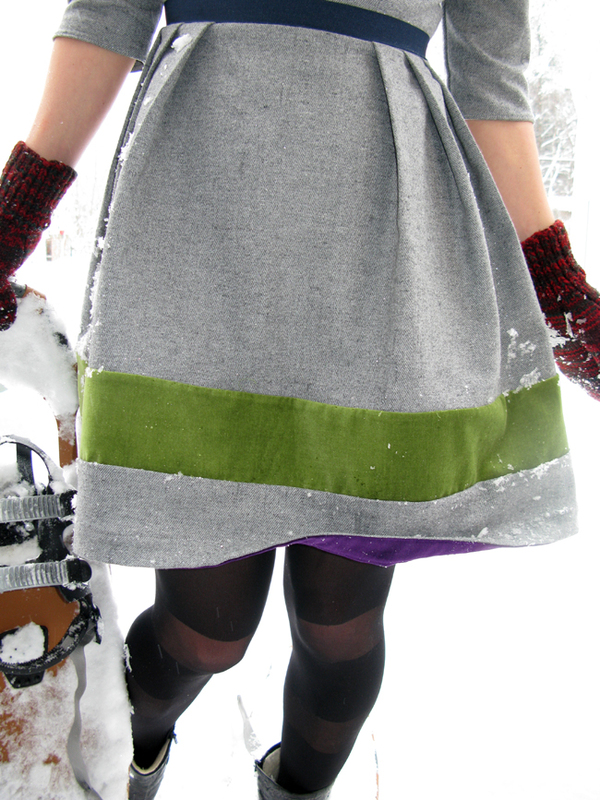 Stay tuned for a third version of this versatile dress! love this wintery version! the velvet detail gives it just the right touch! Thank you Lisa! Happy you approve! Thank you for the free pattern. I cut the dress out last night and I am going to start working on it today. I am so excited to make this dress... its so pretty! Wonderful! Please let me know how it goes! Hi there, how can i get the free design? Thanks! If you go into the 'make this' section of my blog, click on the dress and it will take you to an area where you can downloand it. Happy sewing! Very cute dress! The velvet band, especially in that color, makes it special. Great photography as well. Weren't you cold?!? I'm such a cold weather wimp that there would be no way I could be out in snow like that without being bundled up in a large and shapeless mass! Thank you! The season change is wild isn't it? It's amazing anything grows again come spring. I love this dress! Gorgeous and perfect for winter. Love the dress, and very jealous of your winter wonderland! Thank you! It was a perfect winter day. Ha, thanks Oona! Only problem is, I am struggling with a concept for the spring photo shoot...! Wellington boots?!! Wow! This is too cool! What a gorgeous dress! Awesome-I love that the hidden hem binding contrasts so nicely with the green band above the hem. 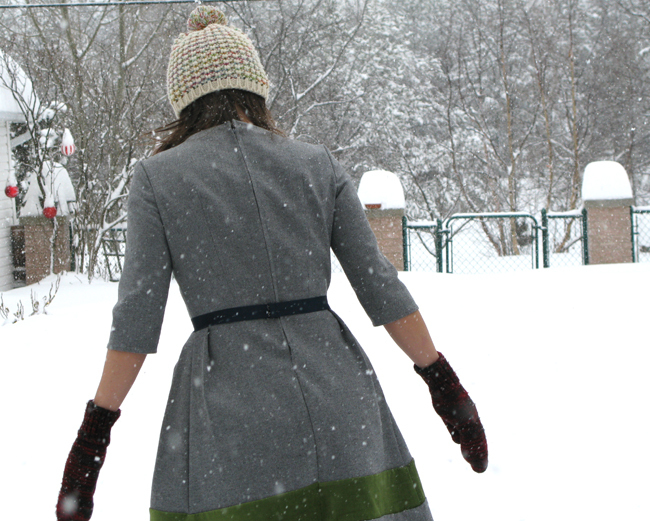 This style really suits you (and I love the snow shoes too). Oh gosh, is that still a problem? I thought I fixed that. Will try again. To be honest I'm also having a hard time commenting on other people's and I don't understand why??.... Thanks for letting me know! What a cute dress! I love that you made a winter version. This is beautiful. Love the velvet band as well. Oh my gosh, thanks so much, I'm touched! I'll get cracking on passing it on. Thanks again and good-luck with the Anise jacket, I've been dying to try it! Love this dress! Just seen it on Pinterest and it's a must to make for winter! Love love love this dress! Just one question--what to do if you dont have A4 paper! It's very hard to come by in the states. Any suggestions? Hi there and thank-you! A4 is USA size "Letter"
I love this dress. Thank you so much for sharing this pattern. I am on my way to go download it now so I can attempt to make a winter version as well. Thank you, thank you!! Hi Marisa, my pleasure! Enjoy!